Soon-to-be super-rich? 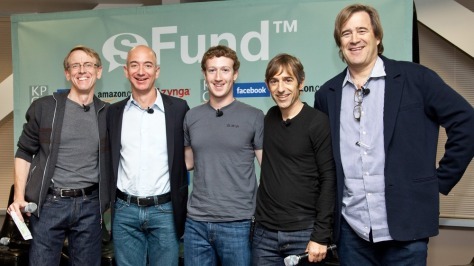 Shown in this photo, from left, are Kleiner Perkins Caufield & Byers partner John Doerr, Amazon.com founder and CEO Jeff Bezos, Facebook CEO Mark Zuckerberg, Zynga CEO Mark Pincus and KPCB partner Bing Gordon. Care to guess who will join Zuckerberg and be raised to billionaire status by the end of this year?